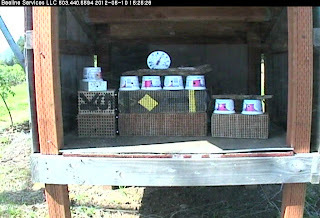 Sunny days at last - Berry bees are active! 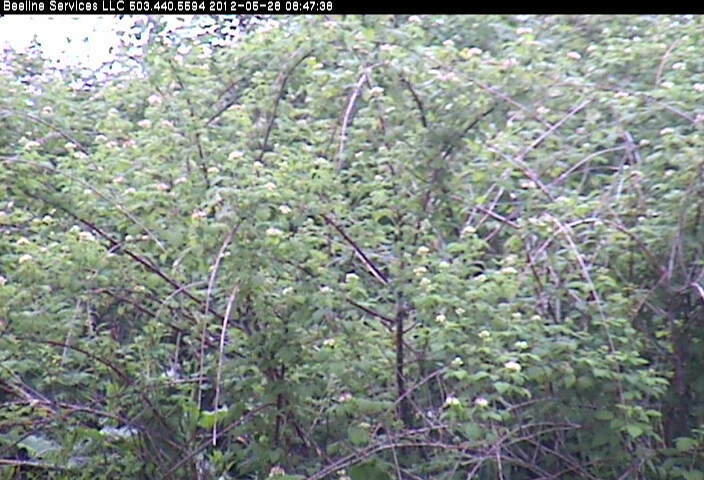 This first image from our webcam shows the black raspberry in full bloom on Monday, May 28. 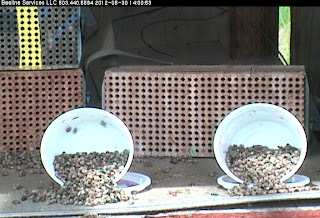 At 8:42am it was only 52oF and the bees were not yet active. It was overcast, so the shadows were subdued and the white clusters of blossoms stand out from the leaves. On sunny days the blossoms are hard to distinguish. By 2:30pm the temperature was up to 65oF with some sun, and O. lignaria were active. At 5:50pm on Monday I watched the blossoms for 5 minutes and counted 3 visitors based on dots that appeared and disappeared from the blossoms, but I couldn't tell if they were honeybees, sweat bees, blue orchard bees, or something else. 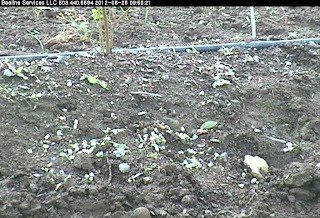 The webcam is too far from the raspberries to distinguish species of small bees. I think large bumblebees would be distinguishable, but I did not see them. Until today there has been very little activity of Osmia aglaia. From past experience I figure that the temperature has been too cold (mostly in the 60s), and that the adults may have been emerging but haven't yet left the emergence containers. But today seems to be warmer, up to 70oF at 2pm. Rosie apparently came out this morning and opened the emergence containers so the O. aglaia would warm faster and start flying. When I noticed the change at 2pm, the O. aglaia were very active. 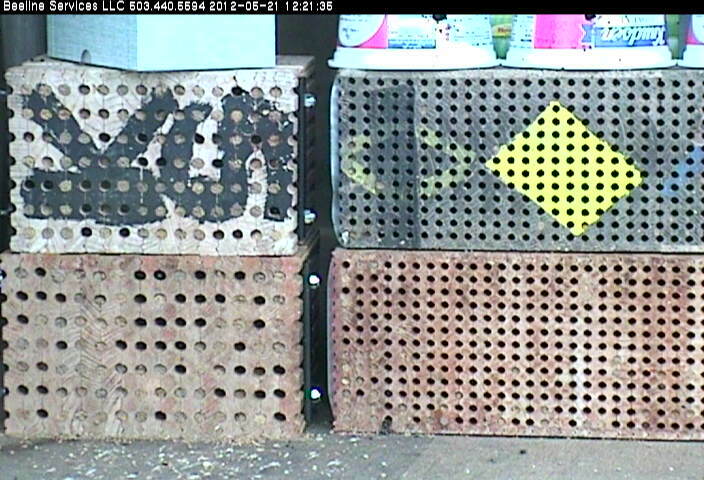 You can see several metalic green bees in the containers, and one sunning next to the container on the left. I also noticed quite a few faces at tunnel entrances in the Binderboard. Hopefully they will get to work pollinating the black raspberry very soon. 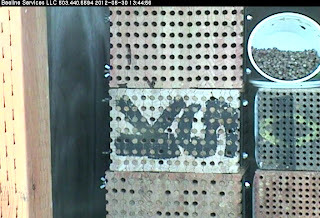 Rosie also removed the O. lignaria emergence containers (they finished emergence several weeks ago) and added an empty Binderboard with large diameter tunnels on top of the first two, because the first two O. lignaria Binderboard are close to full. 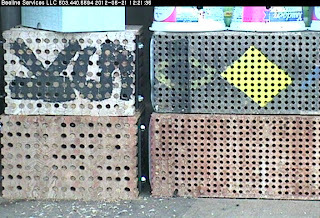 Today I count 85 out of 98 tunnels plugged in the middle, "KS" Binderboard (the one that was on top until today), and 69 plugged tunnels in the bottom Binderboard. There are quite a few of the small diameter tunnels plugged with mud as well. An O. lignaria female checks out an empty Binderboard. Where have all the blueberry flowers gone? Yesterday, Thursday, was another rainy day in Corbett. 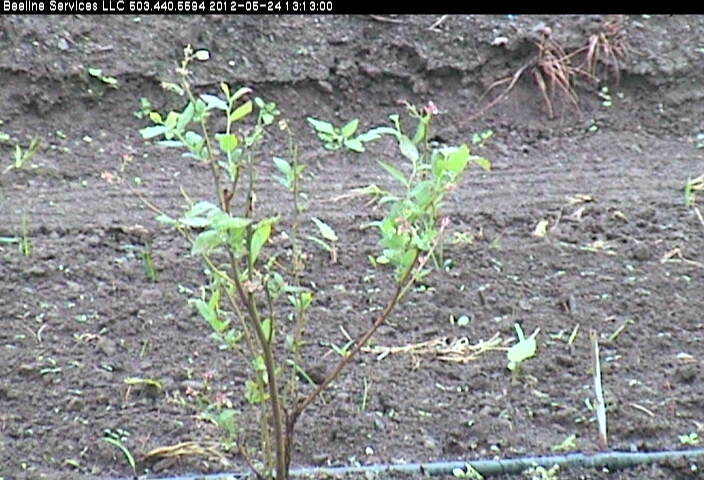 When I checked conditions in the afternoon, about 1:15, I was surprised to see that the flowers on the blueberry plants were gone! They seem to be in full bloom on Wednesday when I checked, so this means there must have been a heavy rain or hailstorm. 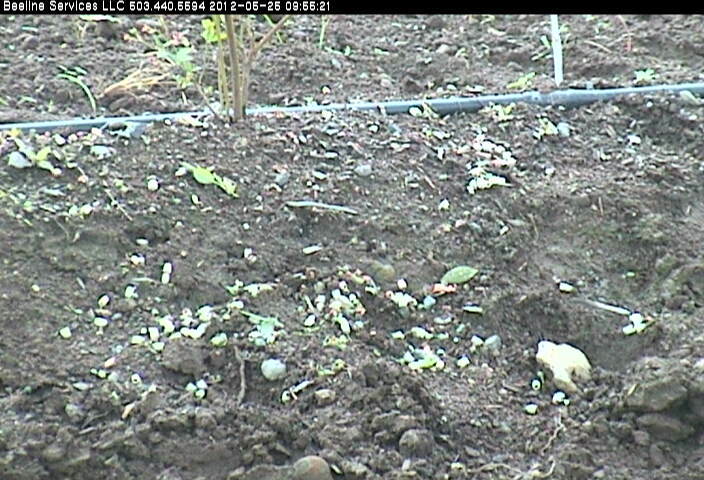 This morning I noticed that there seemed to be patches of white dots under every blueberry plant. 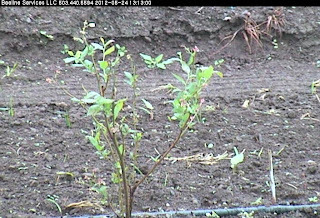 Looking closer under the blueberry plant that I photographed yesterday, you can see the blossoms scattered. This is not good for blueberry yield. I hope at least some fruit has been set. I can't tell if there are still flower buds on the plants that may bloom in a few days. I hope so. So far today in Corbett the sun has been coming out intermittently and temperatures are in the 60oF range. As soon as the sun came out, about 9:40am, the orchard bees, Osmia lignaria, poked their heads out of the nests, and soon were flying. 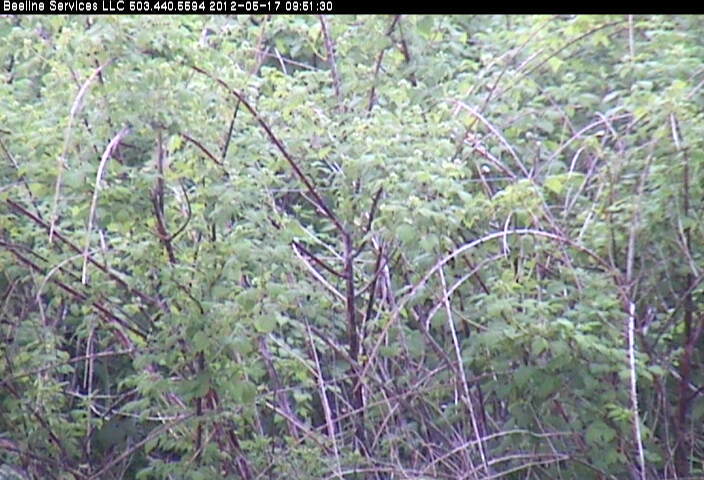 Hopefully they will replenish their nectar supplies at the black raspberries and start working on their nests again. Yesterday and today are rainy days in Corbett, with temperatures in the 50s to 60oF, so I haven't seen much bee activity other than a few O. lignaria females poking their heads out of their tunnels. But since my last post, more tunnels have been plugged. The photo shows the conditions of the Binderboard yesterday around noon. 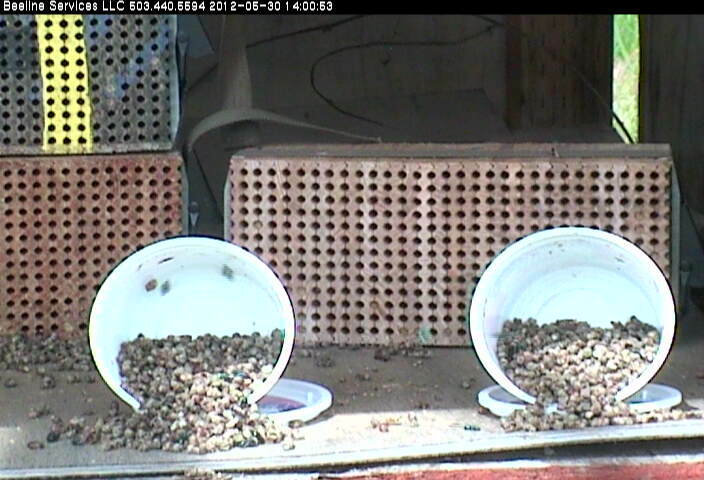 On the left, the top Binderboard has about 73 filled tunnels out of 98, and on the bottom about 59 filled tunnels. That's 13 - 16 new filled tunnels since my last post. 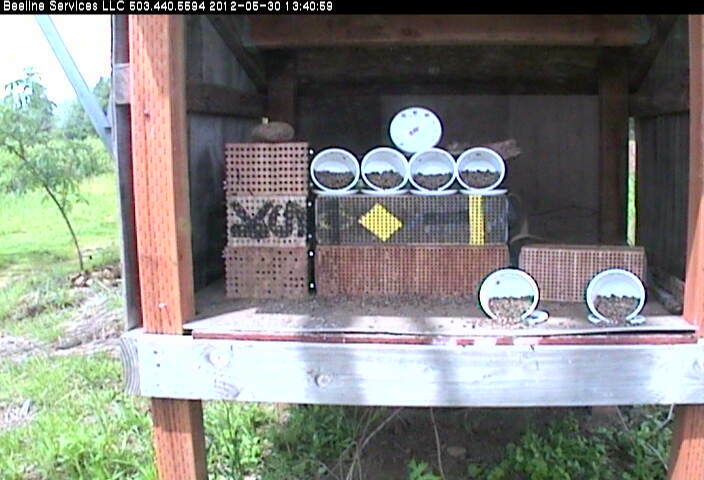 There are also new plugged tunnels in the O. aglaia Binderboard on the right. The mud plugs belong to O. lignaria. 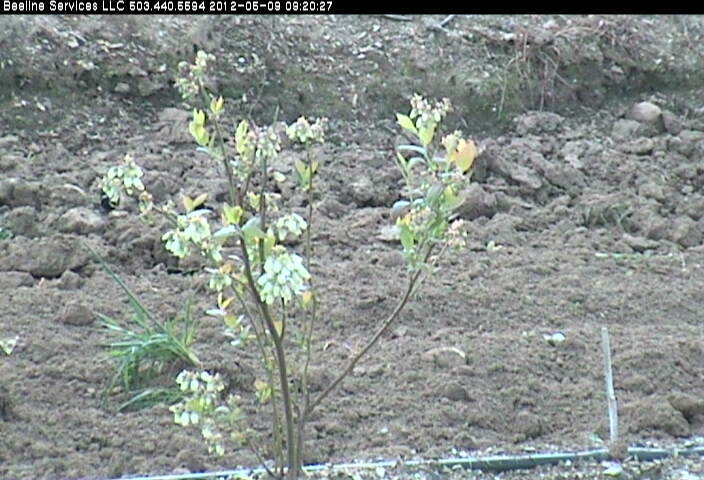 This is one of the ways that the webcam is proving very useful. I called Rosie yesterday and suggested that she put another O. lignaria Binderboard in the shelter. 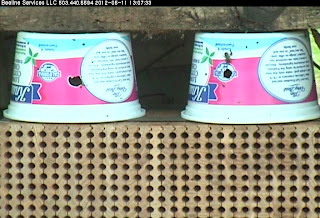 She should also remove the O. lignaria emergence containers from the shelter, since emergence for this bee seems to be over. Rosie is headed out of town, but expects to take care of it later this week. Without the webcam I would not be able to offer her that advice because I wold have no idea what is happening in the shelter. I haven't seen any O. aglaia activity since the day when their emergence containers were put in the shelter. It's probably too cold. Plus, the black raspberries seem to be just starting to bloom, and they are the earliest, or among the earliest, raspberries to bloom. 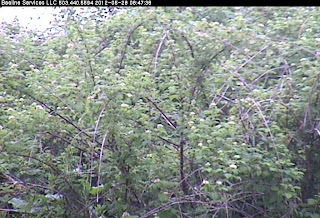 I'm pretty sure that the small white balls sticking up from the branch on the right and at the bottom are black raspberry blossoms. 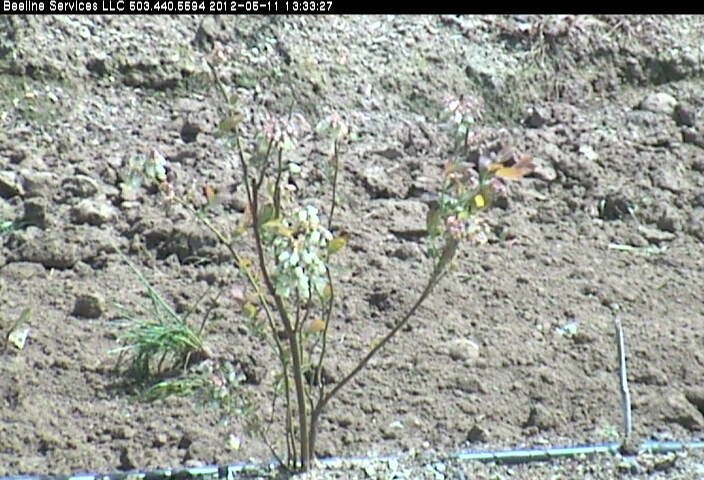 This is as close as the camera gets to the raspberry bloom, so I'm not sure that I'll be able to see many bee visits. 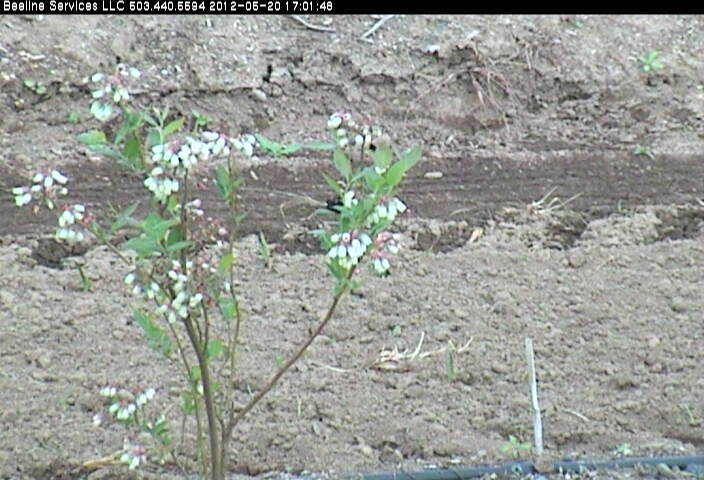 I've been making 5 minute observations of this blueberry plant periodically to get counts of bee visitors. Unfortunately, no bees have visited the blueberry flowers during my counts. 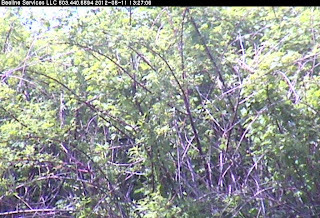 But here is a photo of a foraging bumblebee queen near the top of the branch on the right. She visited on Sunday when I wasn't doing counts. She is only the second bee that I have seen foraging on the blueberries. Rosie mentioned that there are honeybees in the fields now. Maybe I'll start seeing them on the flowers when the weather warms up. O. lignaria nests are filling. I've been out of town without internet connectivity since last Saturday, so I haven't had a chance to look at the bee activity at the Sturm farm for almost a week. The blue orchard bees seem to have been very busy. They have plugged quite a few tunnels as of 9:45am this morning. 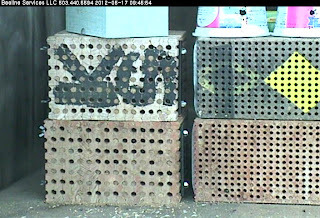 I count about 60 plugged tunnels in the upper, "KS" Binderboard, and about 43 plugged nests in the lower left Binderboard. 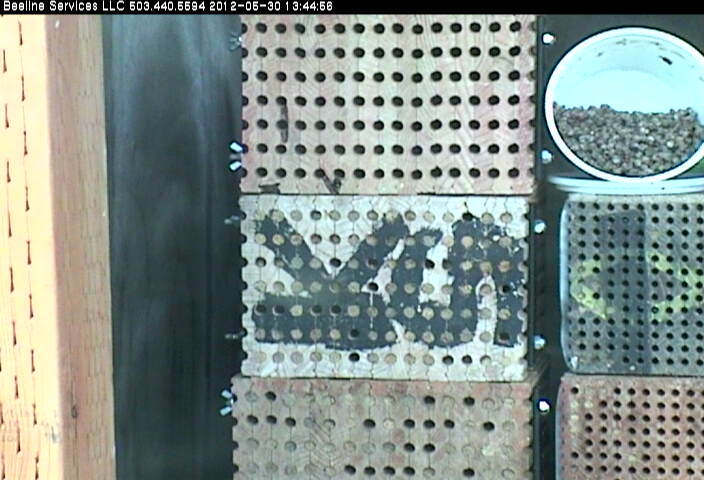 They are apparently also nesting in the O. aglaia boards with smaller tunnels; I count about 24 plugged tunnels in the bottom right board and 3 plugged tunnels in the top right board. At that time of the morning it was overcast and 50oF, so the orchard bees were not very active. 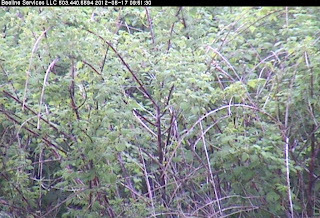 Some are sitting at the nest entrance. 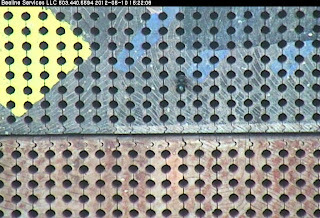 One female can be seen outside of a tunnel ("KS" Binderboard, third row down, 10th hole from the left), looking like she may be plugging a nest, so apparently it was warm enough for some activity. 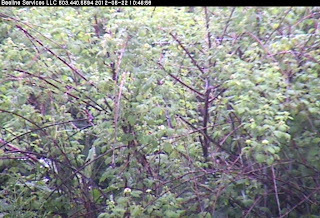 I'm pleased to see that nests are filling well. In fact, I think it's time to put out another empty nest. Overcast light makes it easier to see the condition of the plants. I think that I'm seeing flower buds on the black raspberries. Black raspberry flowers have small petals, so they may be hard to see at this distance. For a close look at the flowers, see photos from June 2011, Part 2 of our visit to the Sturm farm. The blueberry flowers and buds are very clear on the plants in this light. In the short time that I watched I didn't see any bees foraging. I checked the temperature again at 1:47pm; it was sunny and 61oF. At 5:48pm it was still sunny and up to 64oF. With the sun out, the shadows make the flowers difficult to see. 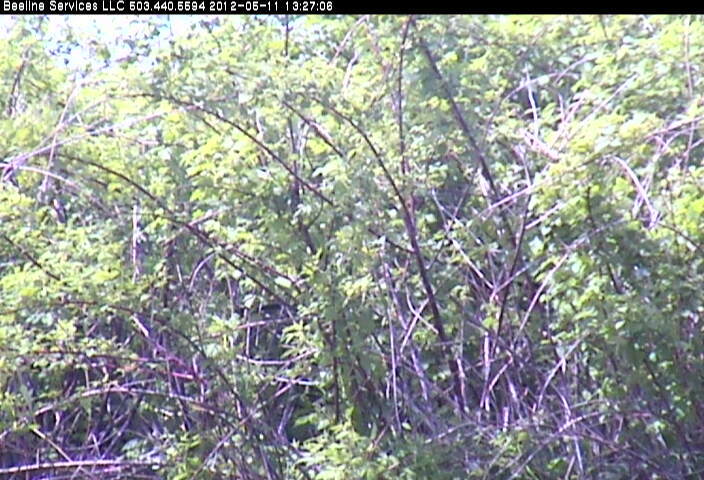 I did not see any O. aglaia activity when I watched the nests today. Probably temperatures in the 60s are a little cool for them. 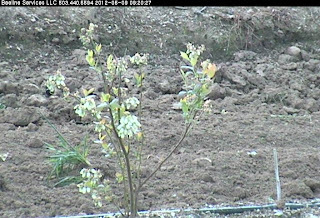 I didn't get on to the webcam until about 1pm Corbett time, but I started noticing emerging O. aglaia right away (after noticing that the thermometer has fallen down again!) 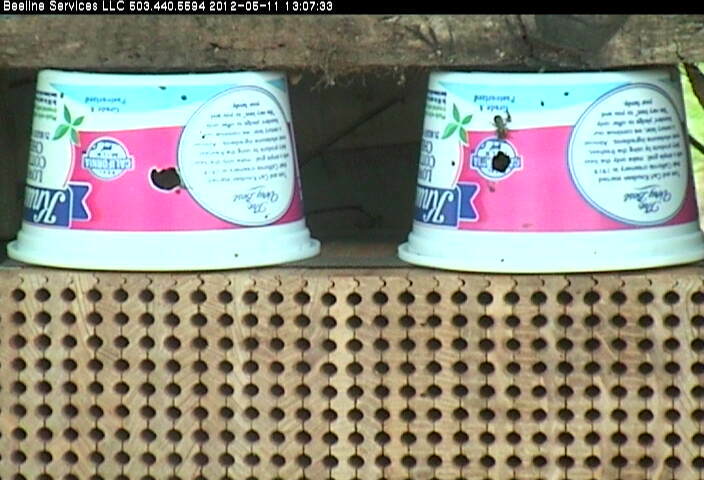 Here's one bee just emerged sitting on the container on the right, just above the exit hole. Probably a male. This image was taken at 1:07pm. Here, for the record, is what the black raspberries look like today, and the blueberry. 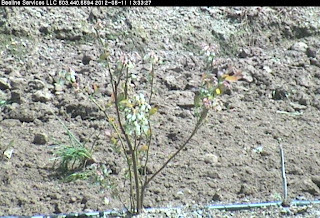 Oregon Berry Bees are in the field! 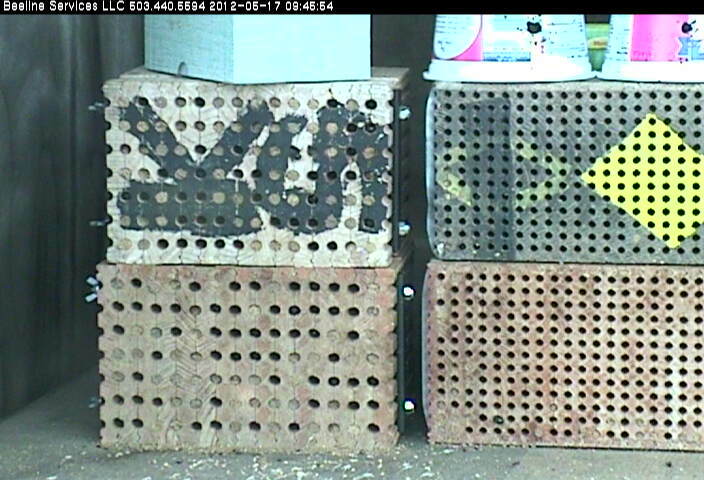 Rosie put the berry bee, Osmia aglaia, cocoons in the shelter today, along with three Binderboard nest blocks. I haven't seen any berry bees flying around yet. They need a few days to warm up before they start emerging. In previous years we have found that they began to get active around the time that Himalayan blackberry starts to bloom. In the last couple of years that hasn't happened until the black raspberry have been in bloom for several weeks. But the last couple of seasons have been wetter, colder, cloudier and later than this season is proving to be. With any luck, the berry bees will emerge and start to forage soon. 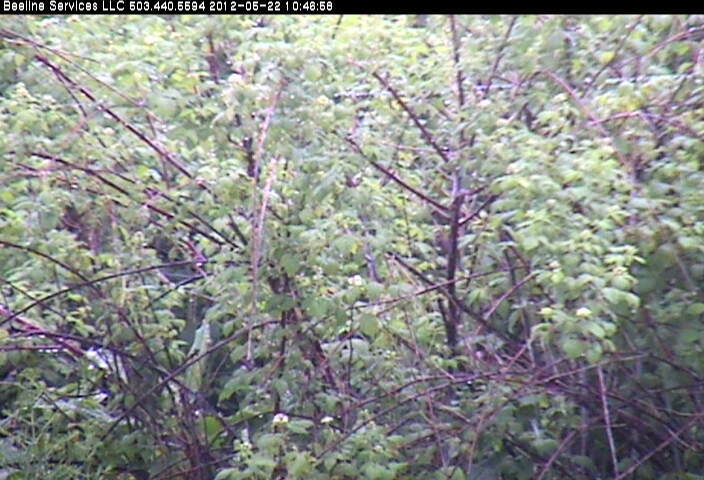 I can't see flower buds or bloom on the black raspberry near the webcam yet. I'm not sure if the flowers will be visible. I'll post photos of the state of the plants tomorrow. Although O. aglaia are not yet active, Osmia lignaria have been exploring the O. aglaia tunnels. You can see one in the photo, below. 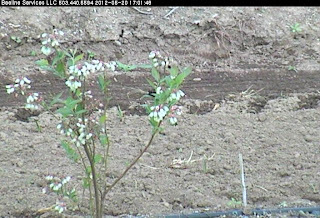 Berry bee nest tunnels, orchard bee is exploring. There have been several sunny days in Corbett, and I've been watching lots of orchard bee activity in front of the Binderboard nests. Males are still active, but I've seen quite a few females as well. However, it's not clear if they have been nesting. So far, no tunnels have plugs. 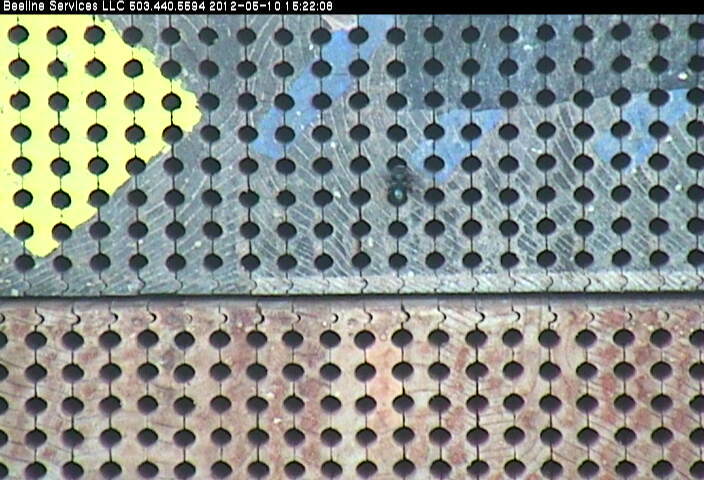 That suggests that there isn't much pollen available near the nest yet. 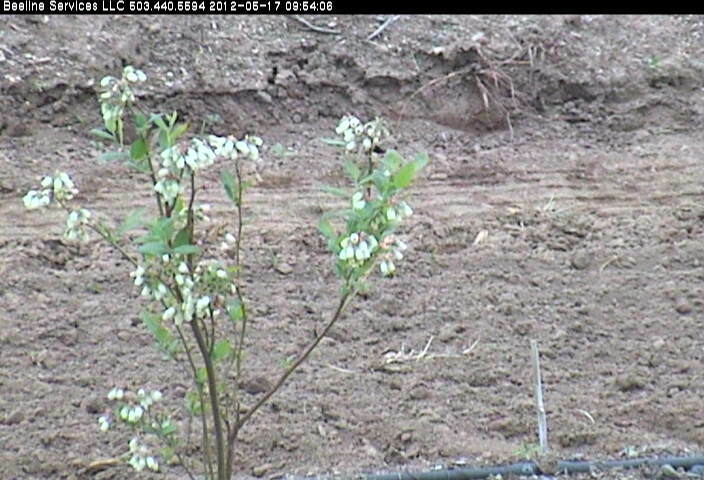 I've been periodically watching this blueberry plant through the webcam, hoping to see pollinator visits. I finally saw a bumblebee yesterday, May 9, at 9:20am. 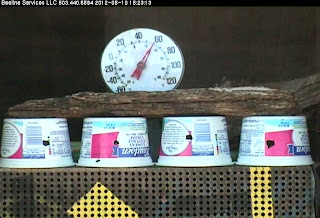 (Note the date and time stamp at the top of the webcam photos). The bumblebee is a big queen, hanging upside down on the far left upper inflorescence. Click on the photo to see a larger version. Her leg is visible on the flowers. 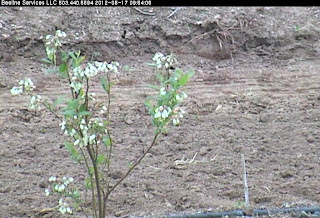 No sign of blue orchard bees on the blueberry flowers in the times that I've watched. In fact, I was beginning to wonder if the flowers are going to be pollinated.